As one of Carnival's older ships, Triumph lacks the plethora of specialty restaurants that you find on new-builds, and the fact that most of the dining options are included is refreshing. With plenty of choices aimed at a squarely American palate, passengers won't go hungry. And here's a secret that might surprise people who see Carnival as a budget line: The food is tasty, much more so than on other lines with higher prices. It's served without pretense, with a menu that encourages passengers to try new things (escargot, for example, is presented under the category of "didja, as in did you ever…") and enjoy old favorites. Service is friendly, not fawning, with waiters who go out of their way to call you by your first name. The main dining room is open for breakfast and dinner on port days and brunch and dinner on sea days. Breakfast hours are 7:30 a.m. to 9:30 a.m., while brunch runs 8:30 a.m. to 1 p.m.
Sea-day brunch is an indulgent affair. Dishes include French toast, steak and eggs, mac and cheese, salmon and pasta choices. There's also a Bloody Mary bar with a lengthy list of garnishes. For dinner, the menu is presented in two sections, "daily specials" and "available anytime." Appetizers for the former might include spinach and artichoke dip, beef and barley soup and escargots, while entrees range from lasagna Bolognese to pan-seared fillet of tilapia and braised brisket. Items available anytime include shrimp cocktail, vegetable spring rolls, broiled salmon, grilled flat iron steak, chicken breast and Southern fried chicken. Heart-healthy and vegetarian options are noted on the menu. Desserts are meant to appeal to all palates, with the line's signature warm chocolate melting cake as an ooey gooey standout. Other choices include New York cheesecake, Black Forest cherry cake, fresh fruit, ice cream and a cheese plate. Guy's Burger Joint (Deck 9): It's hard to resist the fat and tasty burgers served at Guy Fieri's namesake grill -- so why would you? We love the elaborate toppings bar. Open noon to 6 p.m., Guy's Burger Joint is well worth the lines. BlueIguana Cantina (Deck 9): You might already know that you can get outstanding tacos and burritos at this Lido favorite at lunchtime (noon to 2:30 p.m.). But did you know that BlueIguana Cantina is also open for breakfast from 7:30 a.m. to 10:30 a.m.? The arepas and burritos are delicious. 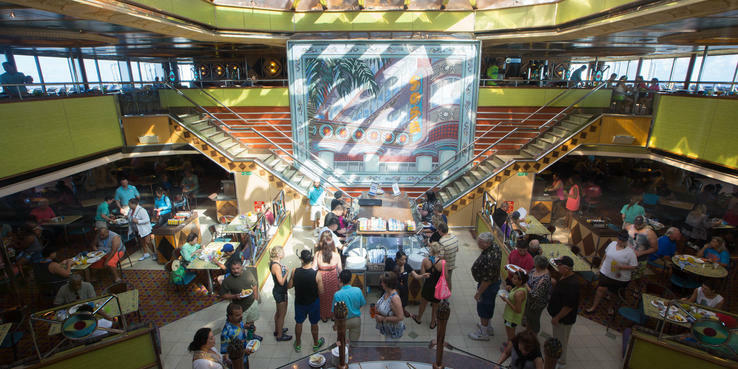 Comfort Kitchen (Deck 9): The bulk of Triumph's buffet line is enclosed in an atrium labeled South Beach. In the mornings, you can get eggs in a variety of styles, as well as sausage, bacon, grits, cereal, pastries, bagels and more. Lines can get long at peak hours. Breakfast runs from 6 a.m. to 10:30 a.m. Lunch brings a pair of carving stations, as well as hot entrees that include fried seafood. There's also a dessert station with an array of sweets; the cake pops are particularly yummy. At night, the Lido offers a salad bar, meats and cheeses, pasta and hot dishes like pot roast, fried shrimp and jerk pork. The carvery station remains, along with the dessert station. It's open from 6 p.m. to 9:30 p.m.
Chopsticks (Deck 9): In the mornings, this counter serves as an omelet station. At lunchtime, go there for a rotating selection of Asian dishes, such as shrimp fried rice, beef stir-fry and General Tso's Chicken. It's open noon to 3:30 p.m.
Carnival Deli (Deck 9): Made-to-order turkey wraps, pastrami sandwiches, grilled ham and cheese, and other deli favorites are served at this counter, open 11 a.m. to 11 p.m.
Off the Grill (Deck 9): Located near the aft pool, this station dishes up omelets and breakfast items in the morning and burgers and hot dogs late into the night. It's open until 1 a.m.
Pizza Pirate (Deck 9): Located near the aft pool, this pizza station gets points for keeping the slices hot and crispy. Another bonus: Pizza Pirate is open 24 hours. Swirls (Deck 9): Several stations labeled Swirls are on the Lido Deck, offering soft-serve ice cream and frozen yogurt in cones or plastic dishes, available anytime. Room Service: On our sailing, all room service items were complimentary. Choices included a variety of hot and cold sandwiches, salads and desserts, as well as Continental breakfast. Cafe Vienna (Deck 5); a la carte pricing: This fanciful space, with Art Nouveau-styled decor, serves up specialty coffees, cakes and gelato ($2.95/small; $3.95/large). Green Eggs and Ham Breakfast (main dining room, Deck 3); $5: Dr. Seuss fans of all ages will get a kick out of the themed breakfast held on one sea day per cruise in one of the main dining rooms. Tables are done up with bright red and blue tablecloths and napkins, as well as centerpieces of the Cat's famous striped hats. Seuss characters make appearances and pose for photos, while passengers order dishes like green eggs and ham, French toast coated in Fruit Loops and regular and red pancakes stacked in Seussical stripes of red and white. Save room for the surprise parfait desserts. Guess what: They're striped, too. Chef's Table, $75: Book ahead for this multicourse tasting experience, generally only held once per cruise. (When we called shortly after boarding to make a reservation, the experience was sold out.) The meal, overseen by the ship's executive chef, also includes a private tour of the kitchen.